Located on the southwest edge of downtown Oklahoma City, the OKC Farmers Market District has been a center of local foods, distribution, and public events since the early 1900's. Embracing its historic role as a farmers market, local food hub, event venue, and production center, the OKC Farmers Market District is home to two weekly farmers markets, a plant nursery, a food truck park, restaurants, bars, yoga studio, breweries, craftsmen furniture designers, industrial manufacturers, and the most picturesque venue for weddings, concerts and more in the City! The legacy of Delmar Garden and the original Farmers Public Market live on today through our local businesses and the wonderful people who support our efforts! Visit us where local food began in Oklahoma City! Open Saturdays 9am-2pm and located on the first floor of the Historic OKC Farmers Public Market, our vendors offer produce, meat, home made goods, honey, baked goods and more. The open market is a year-around affair and features a bloody mary bar! Gathering food from farms and ranches across Oklahoma, Urban Agrarian provides fresh, local food to customers at its storefront and a commercial kitchen for food trucks and entrepreneurs. Open Sundays 10am-2pm and located at Delmar Gardens Food Park, the Delmar Sunday Market offers local produce, crafts and entertainment! Our vendors accept SNAP and welcome you to the community! From the best chile pork verde east of New Mexico at the Power House to incredible vegan cuisine at The Loaded Bowl to diverse food truck offerings at Delmar Gardens Food Park, our restaurants, bars and food trucks have you covered! Home to one of Oklahoma City's best craft breweries, discover amazing craft cocktails, a wide range of beers, and play some arcade games at Rewind Pub while you're at it. Offering its famous 'Chile Pork Verde' daily, along with specialty menu items & handcrafted cocktails, the Power House has a great selection of wine, featured Oklahoma beers, roasted coffee, and live music. Saturdays feature a scratch brunch and Sundays feature a Taco Bar. Anthem is an Oklahoma craft brewing company, offering beers as individual as the people who drink them. Committed to our community, we proudly brew excellent beers and support events routinely. Visit our tasting room for tours, beers, music and food trucks! The OKC Farmers Market District is home to some of the most talented furniture, accessory and craft designers and builders in Oklahoma. In addition to numerous individual makers and designers, the District is home to Urban Farmhouse Designs, Vintage Reclaimed Lumber, Silo OKC, and numerous artisans located in the Stalls at the Farmers Public Market. Over 20,000 sf of antiques can be perused at the Fan at the OKC Farmers Public Market. By reclaiming and re-imagining wood from historical rail cars, cargo containers and other sources, our team of artisans builds objects of beauty and function for every type of customer whether you are brand new homeowners, businesses who want to create exceptional spaces for their customers, or just a lover of DIY who appreciates the use of old materials made new again. A new retail experience in Oklahoma City's Farmers Market District featuring creative products made locally by The Okay See Clothing and Community and Brandon Snider Photography. Featuring unique and locally-themed designs, we screen print our custom designs and accept specialty orders. At Vintage Reclaimed Lumber we build custom furniture-- handcrafted with only the highest quality materials by skilled carpenters. We specialize in using salvaged lumber from all over the United States. 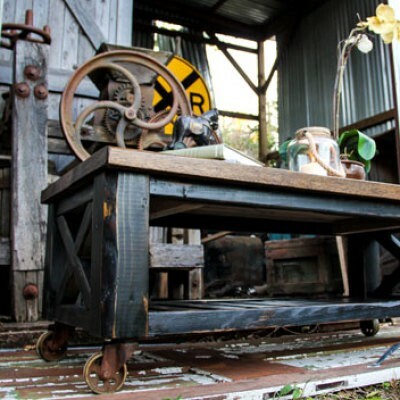 As one of the premier furniture builders in the Southwest, using a combination of reclaimed wood and other vintage components, we pride ourselves in creating one of a kind heirloom pieces. Our on-site event planners can make your dream a reality, whether it is a wedding party, fundraiser, concert, sales event, or private reservation. With over 35,000 sf of event space, the OKC Farmers Public Market & Delmar Gardens Food Park offer private green rooms, in-house audio and visual services, food truck booking, and bar service. Let us host your dream event amidst historic and rustic venues in one of OKC's most up and coming neighborhoods. The Market first opened its doors on June 16, 1928 on the site of the Delmar Gardens Amusement Park. Since then, it has become one of Oklahoma City’s premier event centers – playing host to concerts, antique trade shows, weddings, sporting events, roller derby games, and much more. Let our staff assist you with planning your event at the Market. Featuring ten spaces for food trucks, bar accessibility, yard games, and a 3000 sf covered pavilion, Delmar Gardens Food Truck Park is situated in the heart of the OKC Farmers Market District. Plan your reception, party, private event or festival with us and we'll line up the food trucks and more!